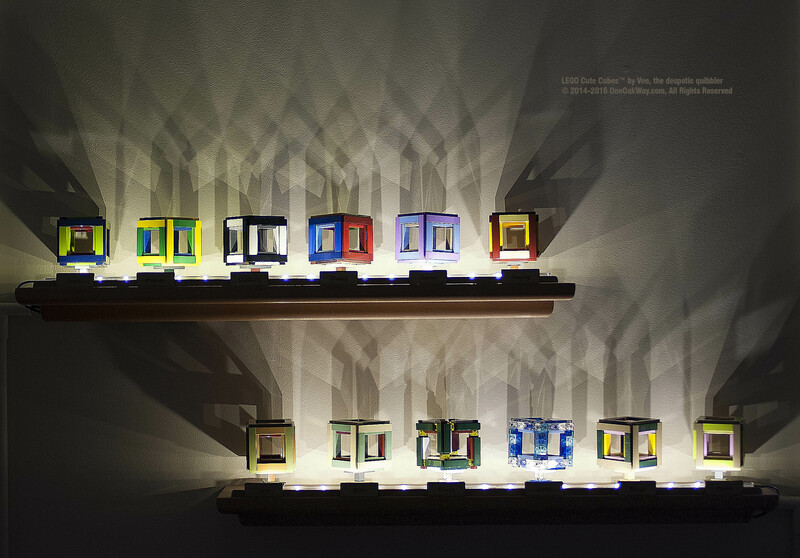 My collection comprises of nineteen cute cubes, each one with its own original color theme, a chronological number and a name. My daughter helped me to create many of these color themes. Here I show fourteen of them since five are still in the making. Creating a new theme may be frustrating because many existing LEGO® colors are not available for the tiles used in the cube and, in some cases, the ones that do exist may be very expensive, but it is rewarding and addictive: you have been warned! After the gallery you can find the instruction manual that teaches how to build your own Cute Cube™. The First Cube - Shades was created after the original paper cube which has one solid color in each face. Shades has shades of those original six colors in each face since there is no way to build a cube with each of its six faces using the same color. Cube #2 - Earth was the first color theme that I created when I still had no idea that I would end up building so many more cubes. It was named after its earthly colors. At some point in the creation of my cubes, I realized that their color themes could work well in pairs, with one cube complementing another so I started "pairing" them. Earth was paired with Shore. Cube #3 - Bliss, an all-green cube. Green is by far my favorite color so it became my next creation. The cube itself was built a lot later though. I thought about calling it "Grass" but then grass reminded me of the famous Bliss wallpaper used in the memorable Windows XP OS. Pairs with Dune but it doesn't have its name tag and dedicated shelf yet. Cube #4 - This is the theme I used to originally present my cubes, then called Open Cube, to Lego Cuusoo, now known as Lego Ideas, hence the Source name. It was initially known as the RGB theme due to the use of red, green and blue tiles, colors that were cheaper to buy than the color themes that came before it. It pairs with Amazon. Cube #5 - Shore, initially named "Sand Green" due to the prominent use of this then rare (and usually expensive) color. Makes a pair with Earth. Cube #6 - Amazon, originally named Tropical because it uses the colors of Brazil's flag, my native tropical country. Pairs with Source. Cube #7 - Sunset. As it should be expected, it makes a pair with Sunrise. As it should not be expected, it was created before Sunrise. Cube #8 - Checkers, originally uninspiredly named Black & White, was created as an alternative to the colorful cubes that came before, a "colorless" cube. Makes a good pair with Shades which is the cube with the most number of unique colors. Cube #9 - Mango. Originally called Carnival because of the use, for the first time, of the colors green and pink which are the colors of the famous Brazilian Samba school "Mangueira". Mangueira is the Portuguese word for a mango tree. Sort of a quixotic story for a name... Pairs with Pastel. Cube #10 - Roman. Initially this was seen by me as a "Weird" cube because it didn't use any tile 1x6. But then I realized that it could actually become a different and special cube and so Roman, a cube based on the colors of Italy, was born. It was the precursor of the mostly transparent Arctic cube and it allowed it to be created since it does not use tiles 1x6 which don't exist in any transparent color. Cube #11 - Arctic. This theme was born out of my desire, since the inception of the cube, to have its structure visible. It is not wise to make a "naked" cube, a cube with no tiles, since the 1x6 tiles help to enforce the precise correct length of the cube edges and the tiles in general add to the sturdiness of the structure so the solution was to maximize the use of transparent tiles. For the structure itself, light colored bricks were used instead of the recommended black bricks (which are cheaper) and also some colorful (and more expensive) bars and pins. Artic pairs with Roman. Cube #12 - Sunrise. It is difficult to tell the difference between sunset and sunrise colors so just keep both together, look outside and decide which one is which at a given day. Also, the twins don't mind if you call them Dawn & Dusk. Cube #13 - Pastel. Uses a rarer lime color, lighter than the usual lime you will find in Lego sets. Due to the use of this less saturated green, it was called Pastel. Also, "pastel" is a Brazilian word for a delicious snack so it bears sort of an extra relation to its pair, the Mango cube. Cube #14 - Dune. Just like its twin, Bliss, it doesn't have yet a name tag and a dedicated illuminated shelf. It was created by my daughter to be a worthy pair of Bliss. Cube #15 - Night Out: a theme with mostly dark and vibrant colors. Cube #16 - Night & Day: a cube half dark and half bright. My daughter's creation to go along with Night Out. Cube #17 - Atlantis; initially called Oceanic, it was supposed to be all in blues; but then, my daughter, its creator, found it to be dull and decided to add a few more colors that made it look like the colors of the ocean. Cube #18 - Blossom: initially called Rose, my daughter's latest and last creation to make a pair with Atlantis. Cube #19 - Fluid: my latest and also last creation initially called the "Leftover Cube" because the idea was to use only leftover tiles from all previously created cubes. In the end, I mixed them with a few new tiles and made another cube that will not be part of the collection per se but instead it will be part of a small set that I assembled and called "Cube Memorial Park". Fluid will have no pair; it'll be displayed at my desk as a constant reminder of our beautiful collection of LEGO® Cute Cubes™. This is my original cube made with paper, scissors, glue and gouache between maybe 35 to 40 years ago that inspired me to create something similar with LEGO® pieces. It was supposed to use the colors of the rainbow but then a cube has only so many faces. Red, orange, yellow, green, blue and violet are represented; indigo is missing. I am so attached to this little cube that I couldn't let go of it in these so many years. The collection in its final display: dedicated and illuminated shelves in my daughter's room. A third shelf may be necessary to hold cubes 13 to 18 but most probably my daughter will just keep them in her desk hutch since her room ran out of available wall space. This same picture, with a better resolution, can be found here. 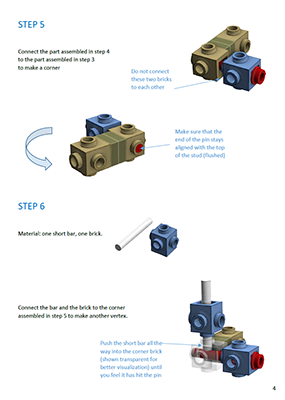 To build your own LEGO Cute Cubes™ follow the steps as depicted in my Instruction Manual. The best way to get the LEGO pieces you will need is Bricklink. Finally, I share here also the LDD file for an RGB Cute Cube™. If you do make your own Cute Cube™, please send me a nice picture of it!